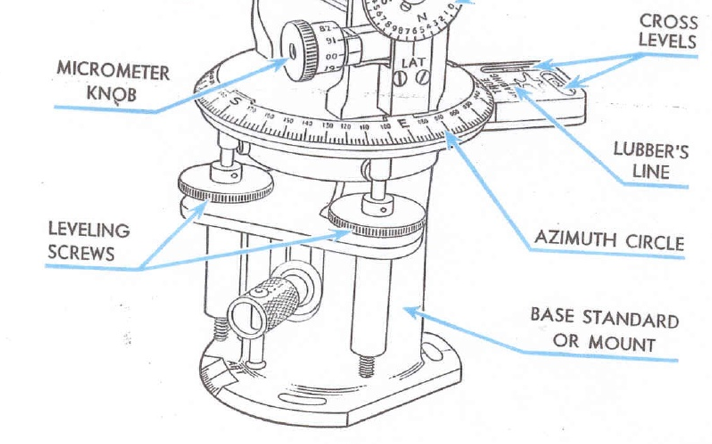 In the spring of 2014 adapted an aircraft Astrocompass, for use at sea. 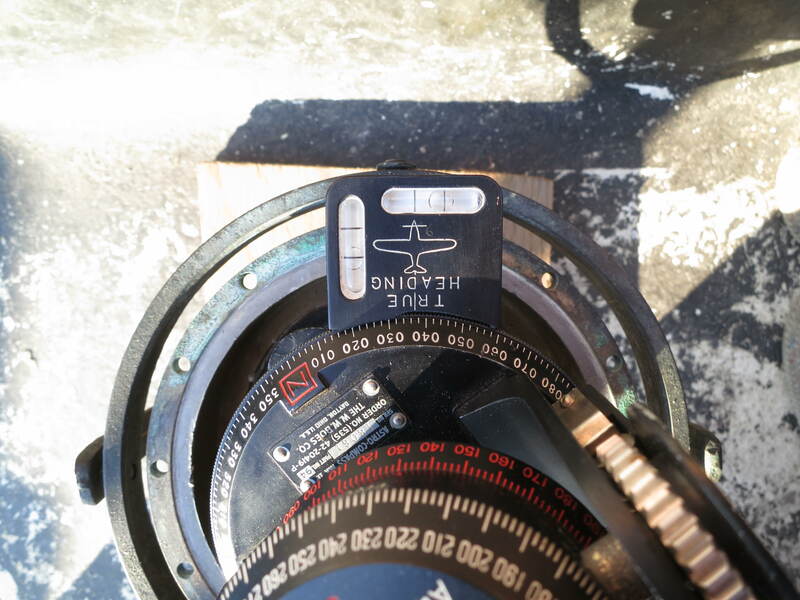 I did this by gutting an old Wood Freeman Autopilot compass, which was gimbal mounted. 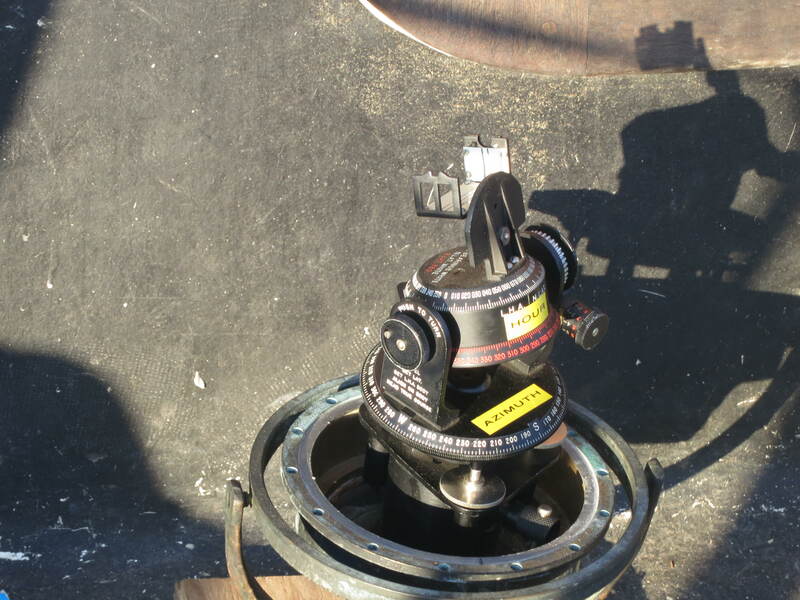 Then replaced the magnetic compass works, with a standard astrocompass mount. Then Samantha and I packed the works up to the Arctic, where Empiricus lay waiting for the thaw. We had experienced some magnetic compass unreliability in 2013 and would have much more ahead f us in 2014. This remaining section of the Northwest Passage, from Cambridge Bay to Pond Inlet would be a perfect environment to test the Astrocompass. In doing so, I hoped to add some redundancy to our navigation systems onboard. When our airfreight arrived in Cambridge bay, we hauled it on board and set the Astrocompass aside as we packed the stores, cleaned and prepared for the crane lift in. Once the chores were a caught up, I assembled the Astrocompass, then went to the forepeak, where the scrap wood is stored. Returning with a small scab of plywood, I screw mounted the gimbal base and socket to the wood plank. The Astrocompass, complete with Gimbal, mounted to scrap wood plank. This was rudimentary but effective, in that I could relocate the little platform as required, for an unobstructed view of the sun, moon or stars, from nearly any surface on the boat. Once I set the assembly up for use, I stowed it below, near the base of the companionway, where it stayed for quite some time. As you may imagine, Samantha and I were quite busy, sailing, navigating and making shift rotations around the clock. Our hands were usually at the helm and I did not make the Astocompass priority for a while. Testing begins in the freezing sunlight. In late August, we enjoyed a stretch of clear weather, where the sun shown clearly, on flat water and we were well rested. The sun finally emerged from the seldom yielding fog and I immediately thought of the Astrocompass. My thought process around the Astrocompass, was that If onboard power systems failed catastrophically, so would our electronics. 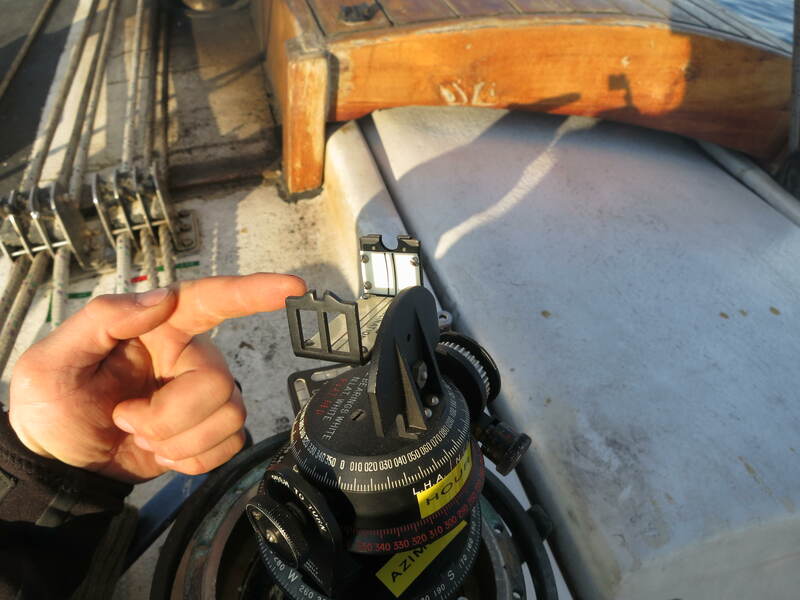 Leaving a useless magnetic compass to blindly guide our way along the chart, in an area where shore is rarely seen and mirages, interfere with pilotage. Of course we were prepared make all sorts of repairs and or use handheld devices. But those solutions are but feeble attempts to replace seamanship with electronic gadgetry. Unlike modern gadgetry which uses circuits and programs to make calculations. 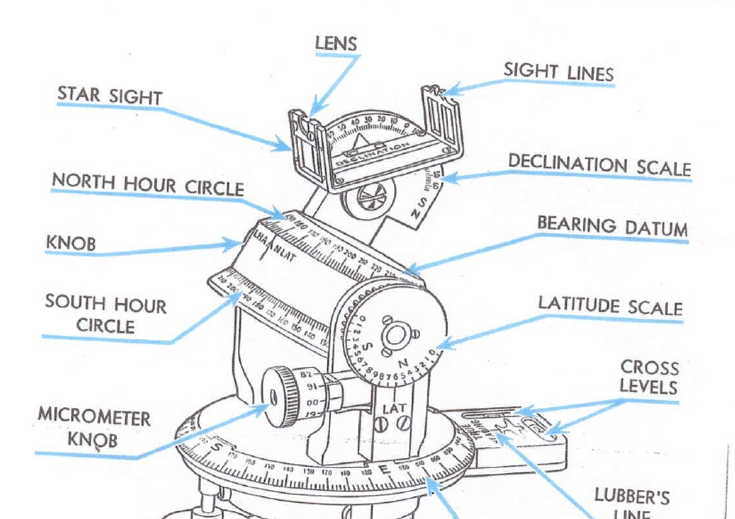 The Astrocompass and Sextant require a human brain and reasoning in order to function. Traditional methods such as these inherently provoke thought and involvement in the navigation process as a whole. I remember when I learned that lesson, having just installed an integrated nav system, where everything interconnected on bus bars and circuits. I had spent days troubleshooting, wiring and installing the system. I learned all about GPS systems and the like, through many cramped hours clutching a wrinkled schematic, under the light of my dimming headlamp. Tracing, labeling and assigning circuits through a web of old wiring, only to go at it again, months later, chasing corrosion and connections which fed the smart little beast, precious power. It occurred to me, that if I devoted as much time, to practicing te skills of navigation, as I did electronic troubleshooting, my skills would be quite good indeed. Years later, this Astrocompass project was simply a continuation of that desire to grow as a navigator. I hoped the gimbal system would work well enough to level the unit at sea. But all would be for not, if I was not proficient in its use. So I locked the wheel, went below, eager to practice and experiment. Just moments later I and returned to the cockpit, with the assembled unit. 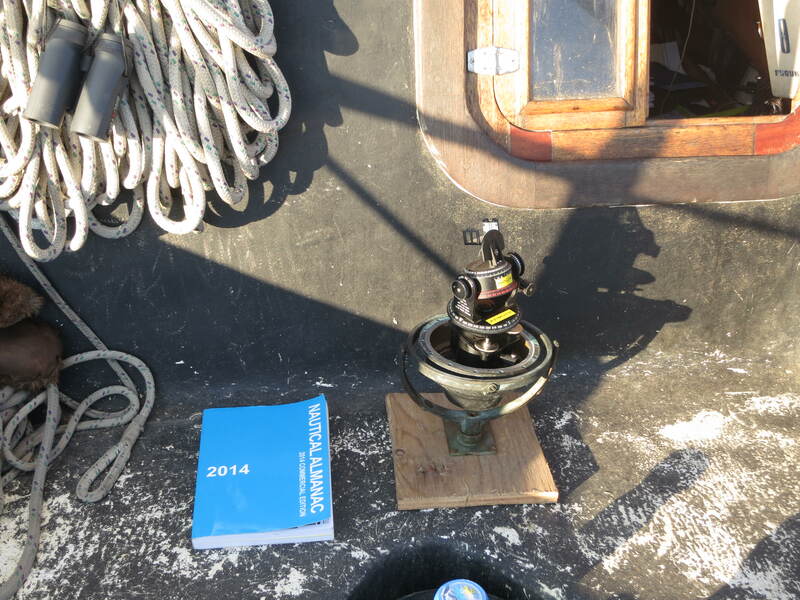 As well as a pencil and paper with our DR Position, and a 2014 Nautical Almanac. 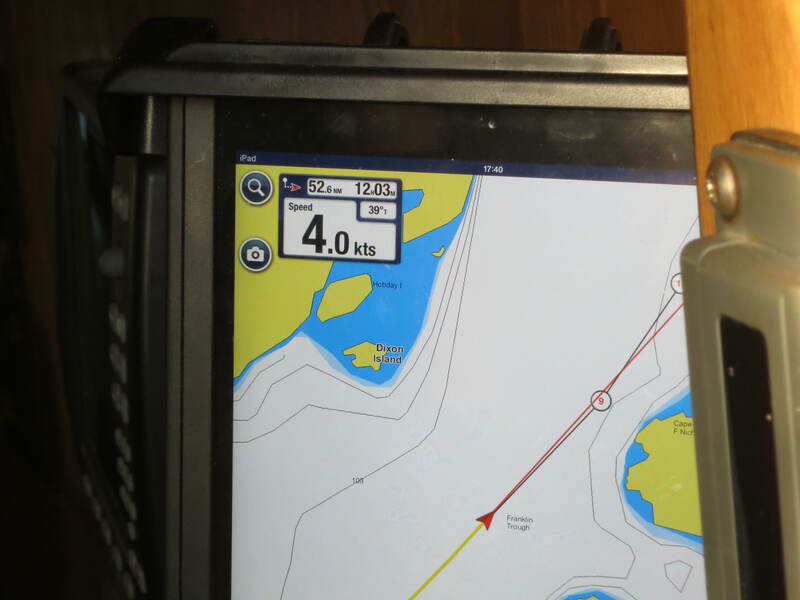 I set the Astrocompass in the cockpit with a clear view of the sun, with the heading line pointed straight toward the bow, near centerline of the boat. The gimbal worked well for leveling the unit, regardless of extreme angles or location. This left plenty of adjustment in the thumbwheels and bubble levels to finish the job. Here is how I put the Astrocompass to use. I extracted the GHA SUN and Dec from the daily pages of the Nautical Almanac, (in place of the Air Almanac) and wrote them down. Next I used the GHA (Greenwich hour angle) and our DR Longitude to calculate the LHA (Local Hour Angle), by subtracting our DR longitude degrees, from the GHA. Now I had 2 useful numbers (LHA and Dec) which I dialed in to the astrocompass. The last data setting was latitude in whole degrees, which I dialed in as well. 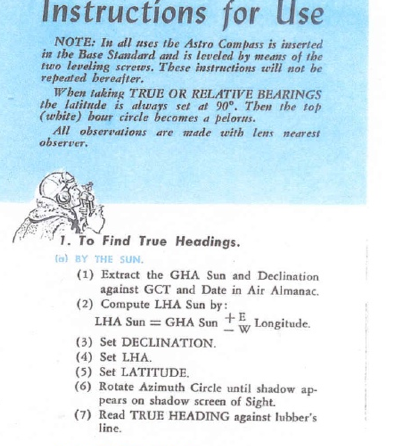 The final step, was to rotate the Azimuth circle, until the shadow from the sight bar, lined up between the two vertical lines, opposite the bar, just below the lens. Once that was done, I simply looked to the Lubber Line and read my heading, in True Degrees. Note the heading in True Degrees with a fairly level unit. This is where it got really fun for me. Once the unit was set up, I could steer to the shadow on the sight bar for quite some time. The only requirement was that LHA required updating, as the sun marched along its path in the sky. The sun was to my portside, so If I steered to port, the shadow would creep clockwise in the sight picture. Then steering back to Starboard the opposite was true. By this method, the helm was tended, in real time. Without the zig zag path of a slowly refreshing GPS track offers. We had a compass again. It worked. In our case, I used the GPS (course over ground) to test the accuracy of our Astrocompass heading. But a very steady helm was required to do so. The reason for that, is a GPS cannot tell us what we are aiming at, only the track you have just laid behind us when moving. A GPS also must refresh its data, which causes a delay. So the track information on the screen is already old by the time you read it. This problem is worse in Northern Latitudes where less satellites are available. This delay can cause an inexperienced helmsman, to chase the GPS numbers and helm a continual “S” pattern through the sea. A frustrating and needless endeavor to be sure. I know, because I did plenty of that, before I knew any better. In Comparison a heading from the astrocompass is in real time, with no lag in readings, given the sky remains clear between us and the celestial body in question. 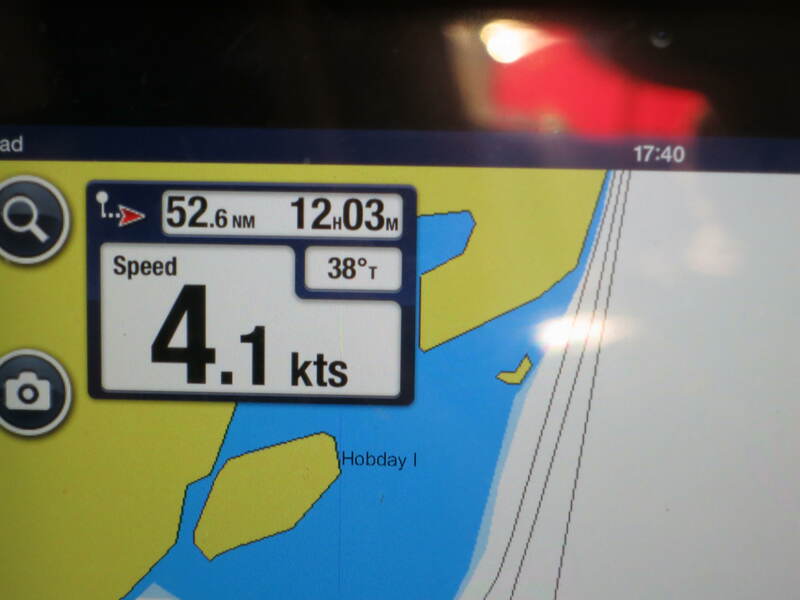 The final possible error in comparing GPS to Astrocompass readings are in regard to course over ground which includes the errors made by drift and leeway. A functioning GPS will calculate these, in regards to moments passed and plot them in an electronic track. Whereas the Astrocompass is pure information, devoid of speculation or unknown influences. But on the day of mention, conditions were flat and calm, with little current. So this comparison was close enough for my purposes. One beautiful thing about the Astrocompass, is the non magnetic, non electronic functioning. Which leaves it unaffected by power loss, or magnetic deviations, from large metal objects, such as winches and handrails. This struck me as particularly valuable, for a few reasons. Such as directional finding when beset in an ice flow. As I mentioned before, a GPS unit cannot calculate direction of travel, without motion. This predicament could leave a disoriented, navigator, slowly probing through tight ice flows, in the wrong, each time they make way, from lead to lead. Believe me, planning to exit a large flow is like a chess game. Without a clear heading from the start any initial and progress, may be in vain. This waste of time and effort, could be avoided by employing an Astrocompass. I am sure it is clear by now that I am a fan of the Astrocompass for use at sea. However I feel the responsibility to objectively consider its use as a primary means of navigation in the Northwest Passage. Based on my experiments, I make the following conclusions. Due to cold icy waters meeting warm low pressure systems in Summer. The Northwest Passage is dominated by fog and or cloud cover more often then not. Those overcast conditions will likely interfere with daily use of the instrument. Aside from the Magnetically Challenged Northwest Passage, the Astrocompass has other uses on the water, which I am just beginning to discover. One such use, may correcting a magnetic compass without the need for ranges or motoring a GPS course. As I practice and gain proficiency, more uses will no doubt be unveiled.